Posted By:Unknown | At:2:11 PM Be the first to comment! There may be something rotten at McDonald's -- and it's not a year-old Happy Meal. The owner of a franchise in Canton, Ohio enclosed a handbill in employees' paychecks that threatened lower wages and benefits if Republicans don't win on Tuesday. "As the election season is here we wanted you to know which candidates will help our business grow in the future," reads the letter. "As you know, the better our business does it enables us to invest in our people and our restaurants. If the right people are elected we will be able to continue with raises and benefits at or above our present levels. If others are elected, we will not. As always, who you vote for is completely your personal decision and many factors go into your decision." The note ends with a list of candidates McDonald's believes "will help our business move forward." It names Republicans John Kasich for governor, Rob Portman for Senate, and Jim Renacci for Congress. With the letter was a biography of Renacci. "The handbill endorses candidates who have in essence pledged to roll back the minimum wage and eviscerate the safety net that protects the most vulnerable members of our workforce," said Attorney Allen Schulman of Canton law firm Schulman Zimmerman & Associates, which received the documents from an employer who stepped forward. "But it's more than that. 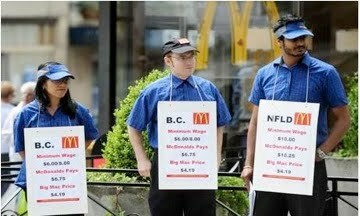 When a corporation like McDonald's intimidates its employees into voting a specific way, it violates both state and federal election law. It's no surprise to anyone that Ohio is a battleground state in this election, and for a multinational corporation like McDonald's to threaten employees like this is morally and legally wrong. This despicable corporate conduct is the logical extension of the Citizens United decision, which has unleashed corporate arrogance and abuse." Schulman turned over the documents to local prosecutors, asking them to "investigate this matter for a criminal violation." Ohio election law specifically states that no corporation "shall print or authorize to be print...or post or exhibit in the establishment or anywhere in or about the establishment...handbills containing any threat, notice, or information that if any particular candidate is elected or defeated, work in the establishment will cease in whiole or in part, or other threats expressed or implied, intended to influence the political opinions or votes of...its employees." On Friday, franchise owner Paul Siegfried apologized in a written statement, saying the communication was "an error of judgment on my part." "Please know it was never my intention to offend anyone," he added. "For those that I have offended, I sincerely apologize." In a statement to The Huffington Post, Shirley Rogers Reece, general manager of McDonald's Ohio region, said, "We wholeheartedly respect diverse views and opinions, and our employees' right to vote. Our position is that every employee should make his or her own choice. McDonald's had no knowledge of this material being distributed. As independent business owners, our franchisees are responsible for matters regarding their own employees. The content of this material is not reflective of McDonald's position. We remain bipartisan on these matters. That said, while clearly this was poor judgment, we don't believe it was intended to offend anyone."